The club host and administrators are in compliance with USA Volleyball and Puget Sound Region rules regarding tournament sanctioning policies. Registrations close 5/13/19 or when all divisions fill, whichever comes first. The 2019 Memorial Weekend Tournament is an open entry for any team that wants to play over Memorial Day Weekend. It is not an “invitational” style tournament, so teams will be accepted first paid, first served, until the tournament fills. Also, this will be a two-day format event, allowing teams to enjoy Memorial Day off. Same number of matches at Emerald City Classic, condensed over 2 days at half the price! The tournament will be held at various schools in and around the Eastside and North Seattle, Everett, Snohomish, and will be a two-day progressive pool play format . There will be two rounds of pool play, followed by single elimination play. Saturday will be at least one round of pool (in most cases, the second round of pool will begin Saturday as well), Sunday will be the completion of the second round of pool and all of the playoff matches. Play will go until later in the day Sunday — with Monday an off day. Depending on numbers of teams accepted in each age division, we may start off with 2-3 divisions. Ultimately, we would like teams to not have to switch sites on Sunday after pool play. * 15's Division: For all U15's and 14's teams, 32 Total Teams. This division will be played at Glacier Peak HS and Valley View MS.
* 13's Division: For all U13's and 12's teams, 12 Total teams. This division will b played at Edmonds Community College. We have partnered with TRAVELING TEAMS® to secure discounted room blocks at a variety of tournament approved hotels close to our venues. Memorial Weekend is NOT a Stay and Play tournament this year, but they are available to help you secure your hotel rooms during this very busy weekend. While not required, it is recommended that all teams traveling from out of town reserve their hotel accommodations through TRAVELING TEAMS®. They have secured the best possible options, and the hotel relationship helps us keep our costs (and entry fees) down. If there is a hotel not listed that you want to stay in, thee is an option available on the website. Thank you in advance for your cooperation! Here is a LINK to the hotel reservation page. We posted a new version of the gym rules on 5/23. We had a few late drops and wil not be using Heatherwood MS. We have also changed Edmonds CC to a 3 court site - so their rules have changed. This year, we will be adding a junior beach tournament to our Memorial Weekend Tournament options. The tournament(s) will be held at our 6-court Bottega Beach Volleyball Facility which is in Clearview and in close proximity to the indoor tournament sites. Current plans are to host one tournament on Friday afternoon/evening and another tournament on Monday, Memorial Day. Registration is done through AES. You can visit www.advancedeventsystems.com to register your team. 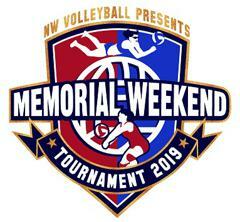 Entry Fees will be processed through Advanced Event Systems (AES) where you can pay online or send a check to “Northwest Volleyball Foundation (NWVBF, 15801 NE 85th St., Redmond, WA 98052). We will begin taking registrations starting November 10, 2017. Teams that enter by 2/20/19will receive a discount. Registration deadline will be when all divisions are filled (typically late March). If a team drops between 1/4/19 and 2/20/19 they will receive a full refund, less a $50 processing fee. There are no refunds after February 20, 2019. Once logged in, add players and staff by clicking the appropriate link. AES integrated with USAV's Webpoint system, if your region uses Webpoint, WE HIGHLY recommend using the USAV Import link. This will save you time. Click on “Enter Events.” Here you can search for events by region and select our event. You will build your roster after you select the event, division(s) per team, then click BUILD ROSTER. Click on Continue. You do not need to build or submit your roster to enter the tournament, however you will need to do so to be fully accepted into the event. Any teams that have not inputted their rosters by 5/18/19 may be dropped from the tournament. At minimum, they will be assessed a $25 late-roster fee, due at the coaches meeting . We typically get quite a few Canadian teams in our tournaments. We ask that Canadian teams connect with our Region Office so that they can gather your documents. The region will collect your documents and contact us and inform us if your team is able to participate. Please do not procrastinate. The region WILL NOT allow your team to play without proper documentation. Below are links to forms that will need to be submitted to our region office so they can clear you to participate. ALL Foreign Teams : A letter of good standing from your national volleyball federation with your team entry and payment. There will be a coaches meeting at 8:00 AM on Saturday morning at all sites. Turn in your WEBPOINT USAV roster at that time. Canadian teams turn in all your documentation to the Puget Sound REgion office and they will clear you. I will receive notificatin from the office which teams are cleared. All you will need to sign is your AES roster. All pool play matches will be 2/3 to 25 points with a 27 point cap. Game 3 is to 15, no cap. In the case of a 3-team pool, matches will be 3/3 to 25 (no cap). All three sets must be played to 25 regardless of the result of the first two sets. This factors into final finish of each pool. Playoffs will be 2/3 to 25, Game 3 to 15 — with no caps in any games. Event tees are provided by Fine Designs and will be available at all sites. We will not be handing out tournament handbooks. Hard copies of gym rules and the tournament handbook will be made available below in PDF format for those that want to print one out. All of the playing schedules will be on AES and are usually posted by Wednesday prior to the tournament. Please print out your pools and brackets from AES. We will update scores and pools continually throughout the tournament. We have traditionally been able to accept teams after the deadline as teams find out their entry status in the Emerald City Classic. Below are the number of teams we will accept in each division. We will also list gym locations as we finalize gym contracts.